OMSLAS, machine shop Tooling and Stamping Dies. He began his career in Turin, in a garage in which it carries out most of its activities. Over the years the business grew until, in 1974, he moved to its current location in Leinì (TO). In 2000 the business was sold by Mr. Van Schalkwyk to his sons Giorgio and Silvia. OMSLAS offers its customers all the experience in the field of stamping and mould construction and tooling, the result of 50 years of work done with continuity, passion and dedication. 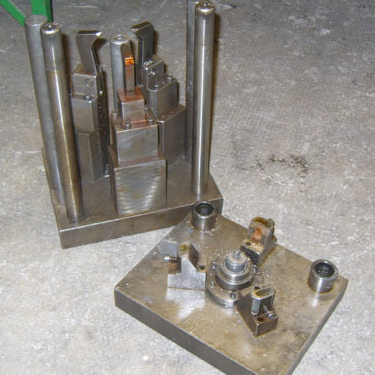 OMSLAS, machine shop Tooling and Stamping Dies. He began his career in Turin, in a garage in which it carries out most of its activities. Over the years the business grew until, in 1974, he moved to its current location in Leinì (TO). In 2000 the business was sold by Mr. Van Schalkwyk to his sons Giorgio and Silvia. OMSLAS offers its customers all the experience in the field of stamping and mould construction and tooling, the result of 50 years of work done with continuity, passion and dedication. OMSLAS, машина магазин инструмента и штамповка. Он начал свою карьеру в Турине, в гараже, в котором он проводит большую часть своей деятельности. С годами бизнес вырос до тех пор, пока в 1974 году, он переехал в его текущее местоположение в Leinì (TO). В 2000 году бизнес был продан Mr. Ван Шалквик его сыновьям Giorgio и Сильвия. OMSLAS предлагает своим клиентам весь опыт в области штамповки и плесени строительство и оснастку, результат 50 лет работы, проделанной с преемственности, страсть и преданность делу. OMSLAS, Officina Meccanica Stampaggio Lamiera e Attrezzaggio Stampi. Inizia la sua attività a Torino, in un garage nel quale svolge la maggior parte delle sue attività. Col passare degli anni l'attività si ingrandisce fino a che, nel 1974, si trasferisce nell'attuale sede a Leinì (TO). Nel 2000 l'attività viene ceduta dal sig. Vitulli ai figli Giorgio e Silvia. OMSLAS mette a disposizione dei propri clienti tutta l'esperienza nel campo dello stampaggio lamiera e costruzione e attrezzaggio di stampi, frutto di 50 anni di lavoro fatto con continuità, passione e dedizione.